Spending time in the outdoors is a wonderful chance to spend quality time with friends and family. Hunting is an exciting activity that will allow you to bond with nature while reaping some of its best benefits and that’s why there are a lot of products designed for hunters who want to ensure that they all their gear and equipment are perfectly stacked and organized on any hunting trip. But all hunting packs are not the same. Some of them promise what they can’t deliver; this is why we decided to prepare the ALPS OutdoorZ Traverse EPS Hunting Pack review to see if it is the best hunting pack available for people who want to spend some quality time in the outdoors while ensuring that they have everything perfectly organized. A hunter will need a big bag that is roomy enough for the gear and equipment, and this bag is the best one available for everything that you might need on your hunting trip or what you will need to pack on your way home. 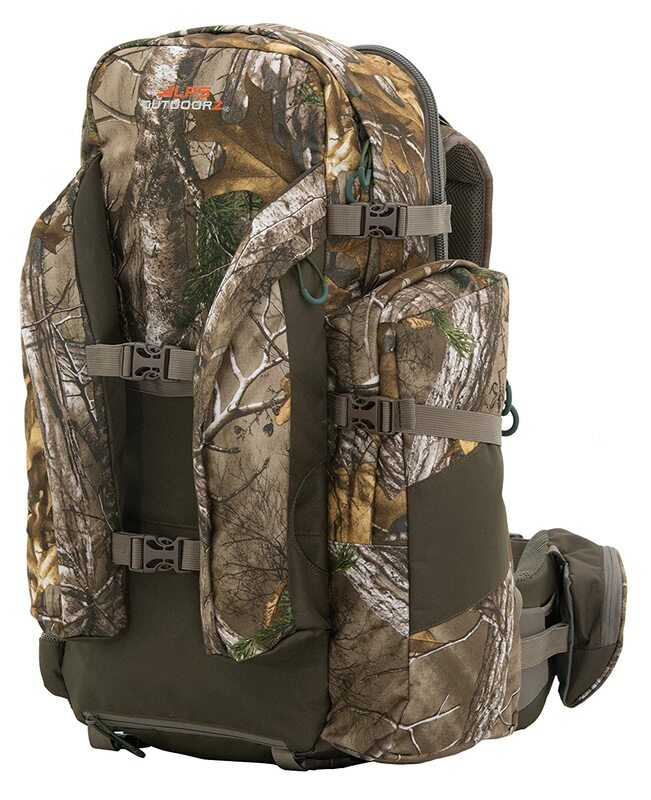 ALPS OutdoorZ Traverse hunting pack has a capacity of 3300 cubic inches in addition to 1200 cubic inches that you can get by unzipping the expandable pack section. This will give you a total capacity of 4500 cubic inches that is big enough to carry a tripod, cameras, bulky clothes and other stuff that you will need before or after your trip. The expandable pack section is designed to carry meat or other stuff that you want to keep separated from the contents of your pack, but you can zip it and unzip it according to your convenience. This means that the bag is highly versatile to cater for different needs. The extension straps are available to secure heavier loads, and this means that you will be able to fit everything you need in this pack. The H design of the bag with internal aluminum is perfect for carrying heavy loads, and this means that everything will be perfectly placed to make sure that you don’t strain your muscles on a hunting trip. The bag features an organization pocket in the main compartment to organize everything that you have and own. There is a special padded spotting scope pocket that is big enough to fit larger scopes in addition to a tripod sleeve holder. This means that all your focus will be on hunting and nothing else. The bag also has a hydration port and pocket that will make the bag hydration compatible. ALPS OutdoorZ Traverse pack is specially designed to make your hunting trip more fun and easier. You will have an exclusive system with zippered pockets that will secure your bow, rifle or rifle scope to make sure that your weapons are well stacked and secured. The wing and drop down pockets will ensure that you won’t lose your arms or worry about carrying them during your hunting trip. When you are hunting, you need to make sure that you are comfortable to have all your focus and attention on your prey. You need to have all your gear carried around without straining your shoulder or back muscles, and this is what you get by using the ALPS OutdoorZ Traverse EPS Hunting Pack. It is perfectly designed to ensure that you can carry all your gear and equipment in an easy way. The padded shoulder harness will ensure that you can carry everything comfortably. The load lifters will take the weight and pressure off your shoulders no matter how long you carry your bag and no matter how heavy it is. The adjustable torso makes this bag suitable for different body builds and this will ensure that everybody can use this pack comfortably. The clip style holsters will allow you to secure the bag to your waist so that you safely secure a handgun. The bag is specially designed to keep everything safe and organized. The main pocket will keep your meat or your equipment safe while the different pockets will allow you to separate different stuff and properly organize them. In addition to the fantastic design, the bag comes with a waterproof cover that will allow you to keep everything dry and safe in any weather. A large pack that is big enough to carry everything that you need on a hunting trip or quality time spent in the outdoors. A unique design with several roomy pockets that will allow you to keep your meat, your accessories, your weapons and all your gear safely sorted and organized. Padded waist belt and shoulder straps will allow for the distribution of weight, and this means that you will not feel tired. This is the best bag for long hunting trips. A large main pocket will keep your stuff organized. The H-frame design will allow you to carry heavy loads comfortably. The bag has a capacity of 3300 cubic inches with an additional room of 1200 cubic inches that you can get by unzipping the expandable pack section. This means that you can fit everything you need comfortably. The adjustable torso will help you adjust it to suit your height so that you can comfortably carry the bag. The front zippered front pockets will allow you to secure your meat and everything you have in a safe way. The expandable pocket will allow you to secure your weapons. Comes with an orange rain cover to protect all your gear. This might not be the best to use if you have a crossbow. It is not suitable for someone who has a longer torso. Q: How heavy is this bag? A: All this pack is quite roomy; it is not heavy as it weighs about 6 ounces when empty. Q: What do the waist straps do? A: The waist straps are helpful when taking the load off the shoulders especially when you are carrying a heavy load. A: No, it isn’t but it comes with a waterproof cover. The ALPS OutdoorZ Traverse EPS Hunting Pack review shows that it is a great bag for hunting trips and other outdoors activities. It is real value for money and will keep everything safe and organized. This fabulous bag will allow you to hold your camera, your meat, and all your equipment in place. It is a sturdy bag that can be adjusted in different ways to cater for all your needs.